I have been using the Seaweed Ionic Clay Mask from The Body Shop for several months now and I wanted to let everyone know about it. I first bought this item because I was looking for something that would keep my skin from being so oily. My sister had recently read a review for this product and she told me about it, because I would be going to the mall the following weekend where The Body Shop is located. While at the mall I talked to one of the Body Shop's workers about this product, she told me that it is something that I would only have to use once a week and that it would help with oiliness and blemishes. So I purchased it and I have been completely happy with it. It costs $22 for a jar, but you don't need to use a whole lot of the product to cover your face and since you only need to use it once a week one container really lasts! I haven't had to buy another container of the product yet! Like the worker suggested I only need to use the clay mask once a week, which I usually do over the weekend. Just wash your face first with whatever you would normally use to clean your face. I just use soap and water. Then use your fingertips to rub the clay mask onto your face. Completely cover your face except for the area around your eyes. Like I mentioned earlier it won't take much to cover your face. You leave it on your face for 10 minutes and then rinse off. This leaves your skin feeling so smooth and fresh. I love it! Plus it really does help with oiliness and I have had but a few pimples since I started using the Seaweed Ionic Clay Mask. 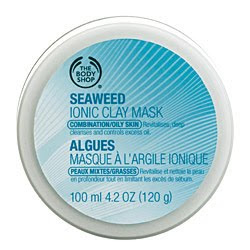 I totally recommend the Seaweed Ionic Clay Mask for anyone who has oily skin or a problem with blemishes. Have you ever tried this product? If so, how do you feel about it? If not, let me know if you decide to try it. I follow u, follow me back if u want! Great review! I must try this out at some point, since I'm a huge fan of clay masks. i would like to try this! clay masks are rad, and they really do help with the oily skin issue! i love masks. they make me feel pampered.